Copyright Des Moines Register. Photo by Christopher Gannon. Used with Permission. Vegetation along public waterways is scattered in agricultural areas. Click on the map to see where insufficient buffers exist along perennial waterways. Perennial rivers and stream are far better protected in some watersheds than in others. Click on the map to see how well stream banks are protected in your area. Counties vary widely in perennial stream bank protection. Click on the map to get detailed about your county. Minnesota is a national leader in recognizing the importance of these buffers in combatting agricultural pollution. The state’s Shoreland Management Act confers legal protection of riparian buffers between most waterways and farmland. Like any other law, however, it must be enforced to be effective. 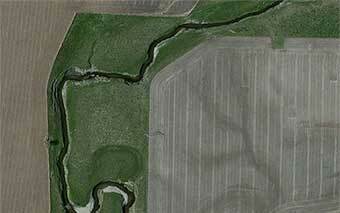 In 2013, the Environmental Working Group used high-resolution aerial photography to assess how well the law is working and to help county and state officials in their efforts ensure the required buffers are maintained between row crops and public waterways. 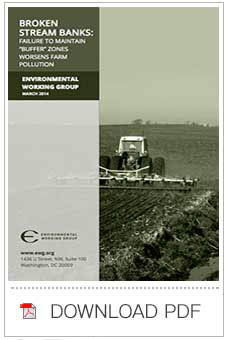 This report and the interactive maps show what EWG found. Only 18% of perennial river and stream banks in agricultural areas are fully protected. While sizeable numbers of landowners maintain the required 50-foot riparian buffers, many others do not. Buffers are often far narrower than required and in some cases are completely missing. Overall, about 72 percent of the required buffering acres were in place in agricultural areas. But the overall average is misleading, because there are large differences among waterways. Only 18 percent (87 waterways) earned an A, meaning 100 percent of the required buffer was maintained along the waterway. In contrast, 21 percent (101 waterways) got a failing grade – less than 60 percent of the buffer acreage was in place. Waterways that earn top grades are frequently next door to areas with failing grades. The wide-strip of vegetation along this stream filters out pollutants and keeps the stream bank from collapsing. 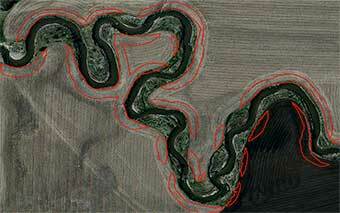 Runoff and broken banks are a major source of pollution in southern Minnesota waterways. The vegetation along this stream is far narrower than 50-feet – in some places crops are planted right up the stream edge. Poorly protected stream banks like this undo the water quality gains produced by other landowners maintaining wide buffers.